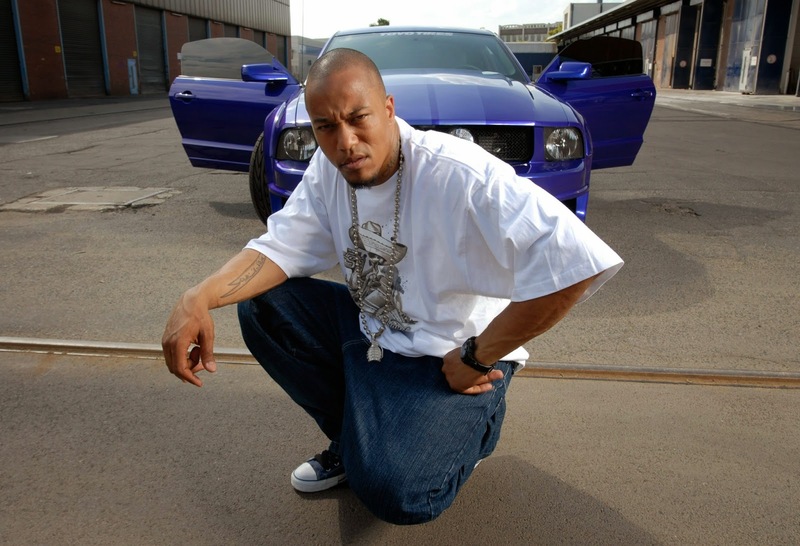 An archive picture, dated June 20, 2005, shows the former rapper Deso Dogg (real name: Denis Cuspert) posing in Berlin, Germany. The Berlin Office for Protection of the Constitution has new insights about the German Islamist Cuspert in Syria. As war in Syria and Iraq attracts a growing number of Muslim extremists from Europe, intelligence officials in Germany believe a former gangsta rapper has joined the inner circle of Islamists fighting there. Denis Cuspert was once a modestly successful member of Germany's hip-hop scene going by the stage name Deso Dogg. Now he calls himself Abu Talha the German and is a top propagandist for the so-called Islamic State (IS) caliphate, which is blamed for several wartime atrocities. His ascent into the upper IS ranks is raising concerns that such "homegrown" Islamists could embolden Muslim extremists in Germany or that they might one day return themselves to target the country for terrorism. "Cuspert won't come back since there's an arrest warrant waiting for him," Elke Altmüller, a spokeswoman for Germany's Verfassungsschutz domestic intelligence agency, told Yahoo News. "But there's a danger he could incite others." And as the cross-border conflict in Syria and Iraq continues to rage, it is luring hundreds of would-be jihadis from Europe, including radicalized converts like the ex-rapper. Although the German authorities have said they see no indications an attack is imminent, they are attempting to track fighters returning from the war zone. An archive picture dated May 5, 2012 shows Salafis praying in Bonn, Germany. Amongst them is former Berlin rapper Dennis Cuspert (2-L). Currently, there are an estimated 400 Muslim extremists from Germany in Syria, either directly engaging in fighting or otherwise supporting the Islamists. Altmüller said roughly 10 percent of them were German converts to Islam. According to intelligence reports, some 40 have been killed in the conflict. That was almost the fate of the 38-year-old Cuspert after he was seriously injured in an airstrike by Syrian forces in September 2013. But he survived, and being wounded apparently helped him win respect among the extremists. He eventually swore allegiance in an online video this spring to Abu Bakr al-Baghdadi, who has since declared himself caliph of the repressive Islamic State. 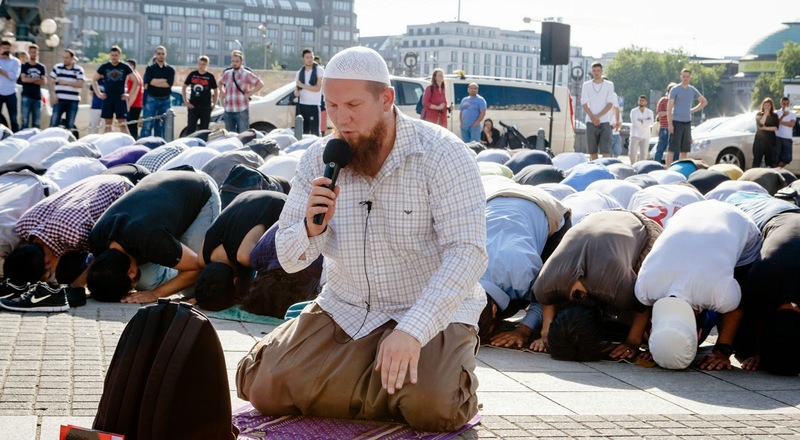 Salafist preacher Pierre Vogel prays with supporters during a rally with aboout 300 participants in Hamburg, Germany, July 19, 2014. Doing time in my skin like Tookie Williams in San Quentin/ No identity, where will this end? In a white world full of hate and illusion/ The last option was only violence and emotion. But he never managed to make it big rapping, and after a car accident he started to look to radical Islam for direction in life. Over the past four years, he abandoned his music career to become an Islamist poster boy in the German-speaking world, posting videos that encourage Muslims to join the caliphate's holy war. "I was a sinner. I lived in sin before I turned to Islam. Surrounded by music, drugs, alcohol and women," he said in one recent propaganda video. Another scene shows Cuspert hitting the head of a corpse with a rock at the site of a suspected IS massacre east of the Syrian city of Homs. The Islamists clearly see the former rapper's potential in recruiting others in Germany, which has a thriving Salafist scene promulgating an especially dogmatic form of Sunni Islam. After two policemen were stabbed during a Salafist protest in the city of Bonn in May 2012, Cuspert used his rap skills to glorify the attacker as "the German lion Murat K." in a poem. And despite renouncing his musical background, he regularly composes Islamic chants known as "anasheeds" in praise of jihad. Salafist-preacher Pierre Vogel, seen on Saturday, June 7, 2014, in Freiburg. According to the German authorities, the man behind the only deadly Islamist attack in Germany, Arid Uka, watched a video of an anasheed by Cuspert before he shot dead two U.S. servicemen at Frankfurt Airport in 2011. Uka's Facebook account was also linked with Cuspert's profile on the social media website. Two other prominent German converts to Islam, Pierre Vogel and Sven Lau, have chosen to remain in Germany, but they also actively encourage the spread of their Islamist ideology. "Vogel and Lau went on tour in Germany in 2014 to promote their cause," Altmüller told Yahoo News. "They might not directly tell people to go to Syria, but it's at those kinds of events where young men are approached by others." She said converts to radical Islam were often especially fervent and fundamentalist. "It doesn't necessarily mean they would be involved in an attack, but they help create the conditions for one," Altmüller said. Vogel and Lau have both had run-ins with the law over the years. Lau was even briefly arrested at the beginning of the year for allegedly sponsoring terrorist activities, but was released for lack of evidence. Neither was available immediately for comment. 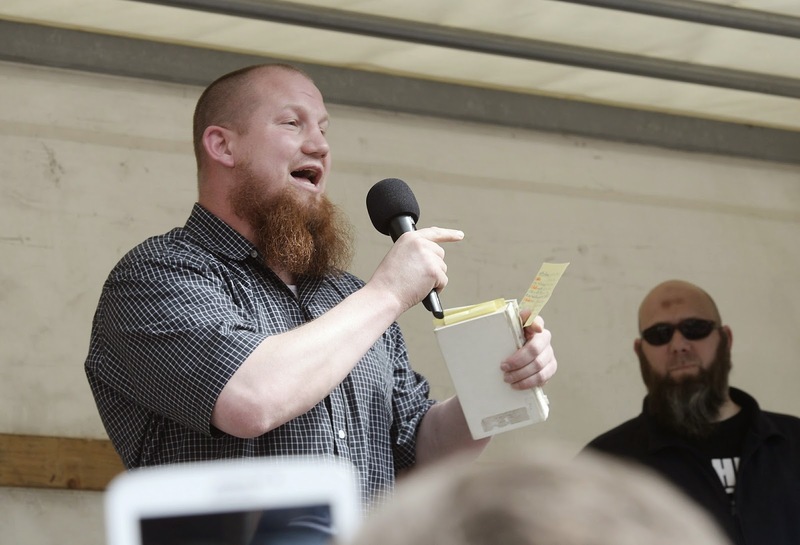 Vogel is a burly ex-boxer who officially renounces violence in the name of Islam, but he has often drawn scrutiny from the German authorities for his virulent rhetoric at Salafist rallies. He also publicly praised Cuspert back in 2010 for abandoning his music career, and appeared interested in whether prominent Muslim rappers in Germany could be encouraged to help proselytize their fans. "Pierre Vogel preaches in German. He uses language that appeals to younger people," Prof. Mouhanad Khorchide, a reformist Islamic theologian at the University of Münster, told Yahoo News. "The ideology being conveyed is dangerous. I regularly receive death threats from Salafists." And Vogel's contemporary, Lau, caused widespread outrage in Germany earlier this month after he organized patrols through the center of the city of Wuppertal by radical Muslims wearing orange warning vests emblazoned with "Sharia Police" on their backs. Handing out flyers demanding the introduction of Islamic law known as the Sharia, Lau's troop reportedly tried to discourage young people from entering nightclubs and gambling halls. The calculated provocation worked, sparking stern responses from several German officials, including Chancellor Angela Merkel. "That is absolutely out of order," she told German TV channel Sat.1. "Nobody is allowed to skulk into the role of the police. The state has a monopoly on the use of force." Merkel's interior minister, Thomas de Maizière, also made clear the government's displeasure. "The Sharia will not be tolerated on German soil," he told the Bild newspaper over the weekend. Khorchide dismissed Lau's Sharia Police as a P.R. stunt, but warned of the growing influence of the Islamists using people like ex-rapper Cuspert. "The Islamic State gives the losers of German society, those already susceptible to Islamist ideas, the chance to feel strong," the theologian said. "Anyone coming back from the war in Syria will be traumatized and full of hatred." But as the rise of the repressive IS regime in Syria and Iraq emboldens extremists in Germany, it is also raising tensions with the country's mainstream Muslim community. Following six suspected arson attacks on mosques last month, moderate Muslim leaders have scheduled a demonstration for today against violence in the Middle East and intolerance in Germany. "We are all afraid of violence, hatred and fanaticism. We have to confront this together," Aiman Mazyek, the chairman of the Central Council of Muslims in Germany, recently told the Berlin-based newspaper Der Tagesspiegel.